Music historian delves into ‘N.. The campus community has until Friday, March 1, to examine the historic events of the 1968 Memphis Sanitation Strike through virtual reality as MTSU’s 2019 observance of Black History Month concludes. The James E. Walker Library’s presentation of “I AM a Man” is underway in the second-floor Makerspace through 6 p.m. March 1. The award-winning interactive story places the user into the events surrounding the strike, which culminated in the April 4, 1968, assassination of the Rev. Martin Luther King Jr. 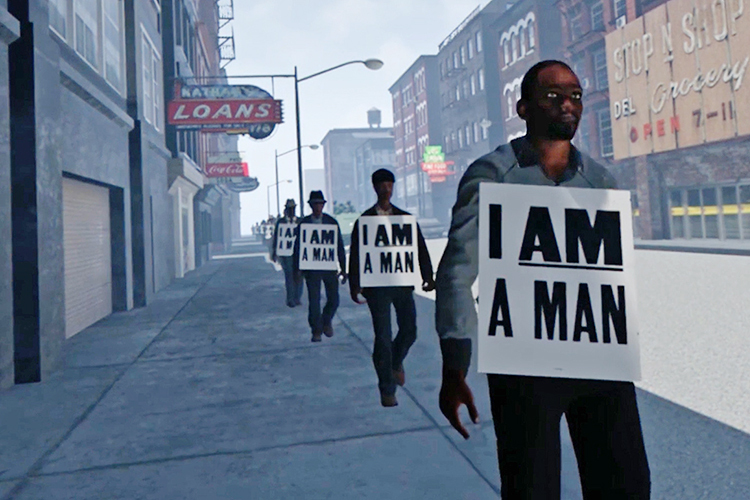 Using the Oculus Rift VR headset, participants can find themselves on the sidewalk with demonstrators wearing “I AM a Man” sandwich boards and at the Lorraine Motel on the day of King’s assassination. Organizers are advising viewers that simulated gunshots are part of the experience, which might make it too intense for some participants. You can watch the “I AM a Man” trailer above. For more on the experience, please visit http://iamamanvr.com. A campus map is available at http://tinyurl.com/MTParkingMap. Off-campus visitors should obtain a special one-day permit from MTSU’s Office of Parking and Transportation at 1403 E. Main St. or online at www.mtsu.edu/parking/visit.php. For more information, contact the Makerspace help desk at 615-904-8526 or Valerie Hackworth at 615-904-8545 or valerie.hackworth@mtsu.edu.